Whether expanding an industry’s presence, a corporation’s footprint, advocating for legislation, launching a brand or managing a crisis, it is crucial to have a knowledgeable team with strong media contacts and the experience needed to navigate any situation. At PLUS Communications, our media relations professionals have long-standing ties to national, Beltway and trade journalists – and our network of field operatives maintains the same quality of relationships with local and regional reporters across the country. 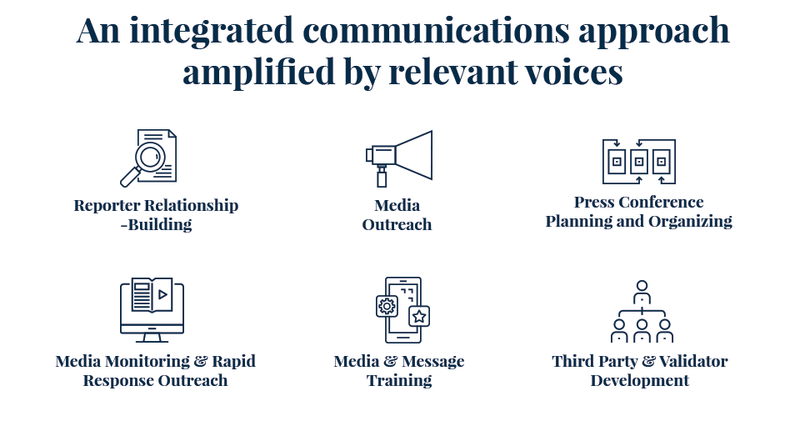 We have extensive experience helping our clients define their voices, refine their messages and training in-house staff to interact with reporters. Our media experts can also serve as on-the-record spokespeople, help plan and execute high profile media events, or connect an organization’s leaders with the reporters who are shaping coverage of the issues that matter most to them. Our team helps clients stay up-to-date on the news that matters with 24/7 media monitoring and real-time alerts that detail the online reach of stories – from clicks on news sites to engagement on social media. Our war room goes beyond keyword searches and computer algorithms – we employ seasoned analysts and specialized tools to track complex issues and provide actionable intelligence.